Defensive Player of the Year C.D. Daniels, Coach of the Year Fred Yancey and Co-Offensive Players of the Year Hamp Sisson and Larry McCammon. Journal photo by Marvin Gentry. Fred Yancey has been coaching football for almost 50 years; his first team was in 1969, right after college. Being named Over the Mountain Journal Coach of the Year is certainly not the first time the Briarwood Christian legend has been recognized for his leadership, but the accolades never get old. Each team he’s led over the past half century has its own character, and Yancey can recall each of them, from the state championship winners of yesteryear to the runners-up of 2017. There’s a fraternity of coaches Over the Mountain, even if they don’t all compete in the same region or classification. Yancey and Buddy Anderson are the elder statesmen, but they both still learn from and rely on their younger peers. The young dogs don’t have many new tricks, though. New tricks don’t really exist in football, Yancey assured. Technology and equipment have changed, but the old ideas are tried and true. Yancey said teams are reverting to old tackling practices. The Lions have a lot returning and they’ll begin preparing for 2018 in May. It will be Yancey’s 49th season as a football coach. Running Backs: D’aire Johnson, Spain Park; Larry McCammon, Hoover; J.R. Tran-Reno, Briarwood. Offensive Line: Will Carothers, Mountain Brook; Jacob Feenker, Oak Mountain; Michael Maye, Hoover; Jayme Simmons, Spain Park; Anderson Tomlin, Mountain Brook; Cydrick Walker, John Carroll. Tight End: Clay Stearns, Mountain Brook. Wide Receivers: Tyshawn Buckner, Homewood; Wilson Higgins, Mountain Brook; Shedrick Jackson, Hoover; George Pickens, Hoover. Place Kicker: Barret Pickering, Hoover. Defensive Line: Joe Bird, Mountain Brook; Rob Cook, Spain Park; Blake Hester, Spain Park; Antoine McGhee, Homewood; Cedric Toosen, Spain Park. Linebackers: Nick Belt, Mountain Brook; Mark Hand, Briarwood; Isaiah Hubbard, Hoover; Gabriel Russell, Briarwood; Colton Yeager, Mountain Brook. Defensive Backs: Will Brooks, Vestavia; Chase Brown, Hoover; C.D. Daniels, Homewood; Jonathan Hess, Vestavia; Zach Nelson, Oak Mountain; Andrew Sherod, Briarwood; Kris Wilkens, Homewood. 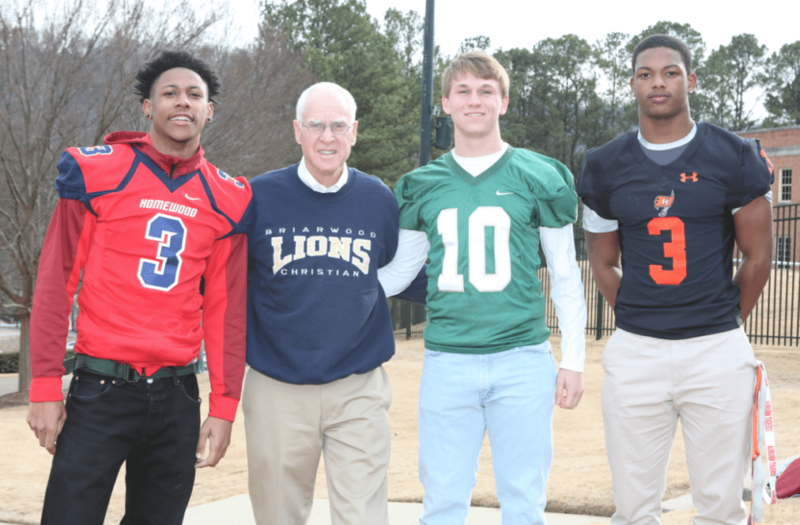 Members of the OTMJ All-OTM Team are selected by votes cast by the head football coaches at Briarwood, Homewood, Hoover, John Carroll, Mountain Brook, Oak Mountain, Spain Park and Vestavia.